The A14 is currently road on which far too many people are being killed and injured. Congestion and incidents result in travel times being inconsistent which has an impact on the region’s economy. A Police and Crime Commissioner should, along with the region’s other elected representatives, make it an urgent priority to make the road safer, reduce injuries and deaths, and ensure more consistent travel times. There is a need for basic roads policing to ensure particularly the heavy vehicles are mechanically sound and being driven safely, and in accordance with the law, by qualified and alert drivers. A key thing is to deter heavy vehicles from using the road in numbers which exceed its safe capacity, so pushing for the investigation and adoption of strategic alternatives including utilisation of other ports and routes to bring goods into the country and the opportunities for greater use of rail transport are worthwhile. While I oppose tolling in general, it may be appropriate as a way of deterring some HGV use in peak hours. 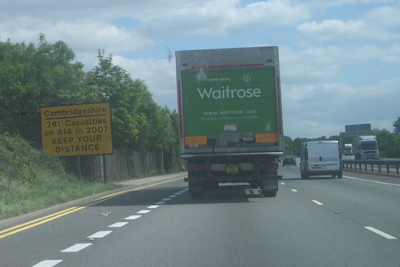 Significant investment from national government is needed to effectively connect the M11 to the A1(M) with a motorway standard road, which does not contain the hazardous features currently present on the A14 including short slip roads and junctions with very minor roads. I think there needs to be greater openness from the police, who should proactively publish their incident reports, so that policy can be made in light of evidence on what is causing incidents. Proactive publication could also enable drivers to be better educated about the circumstances of accidents with a view to preventing recurrences. This entry was tagged A14, Police, Police and Crime Commissioners, Policing, Road Safety, Speeding on October 12, 2012 by Richard Taylor.